The FCSA UK shoots an annual championship competition system. To compete in the annual championship you must be a club member and have attended at least two FCSA UK events in each competition year. We try to keep competition to the summer months to reduce the risk of cancellations due to weather. If you require individual scores for any practice shoot then please contact a club official. Practice is conducted throughout the year at Javelin, Warcop, Lydd, Sennybridge and Eskdalemuir. Above: Raton 2017, best results to date! Due to increasing demand for specialist competitions we have split the FCSA UK competitions into 5 distinct sections, only the 50cal competition has separate sub sections that are segregated by rifle type. Competitions 1 to 4 are specific to the UK using electronic reactive targets, these have been arranged to make best use of UK military field firing areas. The reason being that several training areas do not permit target checking between 0900 and 1700, therefore checking paper targets can be an issue. Paper target 50cal competitions are a separate category and are conducted on particular ranges that provide unhindered access to the targetry such as Eskdalemuir, see section 5: "Classes of competition" below. Anchoring of the rifle to the ground by any means is prohibited and the firearm must be free to be lifted straight up from the firing position. Rests or bipods are mandatory for all competitions. 1.1 Electronic reactive figure 11 targets are used at distances of 1000 yards, 1450 yards and 1760 yards. Exact distances are dictated by range conditions on the day, however will not be adjusted once the competition starts. 1.3 Each competitor is to engage the 1000 yard target with 6 rounds in 60 seconds, the first shot is a non scoring sighter. The clock starts on the first report. 1.6 If the shooter fails to fire all 5 shots per distance stage within 60 seconds then the shooter must proceed to the next distance. 1.7 The rifle must be shot from either the prone supported, or fire-trench supported position. 1.8 Total time for all 16 shots is 3 minutes. 1.9 A magazine may be used but not charged until the timer starts. 2.1 Rifles to be shot from the prone position, or from a fire trench. Benches or tripods are forbidden. 2.2 Only the NRA MR-1 600 yard target is approved for the 338/416 1000 yard competition, or a British military SARTS/ETR figure 11 target. 2.3 This is a timed event. 11 shots in sequence to be counted, maximum time permitted is 5 minutes for all 11 shots. The first shot is a non scoring sighter. 3.1 Any historic anti-tank rifle may be used (originally constructed between 1918 and 1945), no modifications permitted. 3.2 Rifle must be shot from the prone supported position, or from a fire trench supported. Benches or tripods are forbidden however bipods, mono-pods or skis are allowed but only if the rifle was originally manufactured with the support device used. 3.3 The rifles original sighting system must be used, whether that be iron sights or optics. 3.4 In an attempt to partially simulate a "practical" firing cycle this is a timed event. Magazines may be used, and one magazine may be charged before the competition commences. 3.5 Two 600 yard figure 11 ETR targets per competitor are to be used for this competition, (or 600 yard NRA target if accessible on the day). One is to be placed at 300 yards, the other at 600 yards. The 300 yard target is to be engaged with 5 rounds within 90 seconds. The shooter is then given 60 seconds to adjust sights and replace or recharge the magazine (assuming one is fitted). The 600 yard target is to be engaged with a further 5 rounds within 90 seconds. Total time for the event is 240 seconds. 3.6 Every shot to be scored. 3.7 Assistance from a spotter is permitted. 4.1 Rifles to be shot from the prone supported position, or from a fire trench supported. Benches or tripods are forbidden. 4.2 Only the NRA 1000 yard target (72" x 72") is approved for FCSA sanctioned 1760 yard shooting competitions, this target is to be placed at 1760 yards from the firing point. 4.3 This is a timed event. 5 shots in sequence to be counted, maximum time permitted is 10 minutes for all 5 shots. Every shot to be scored. 4.4 Only turned brass, TP or TP-T projectiles may be used (target practice/tracer). Rifles and ammunition must be held on a section 1 firearms license. Ammunition must have a fixed projectile with percussive primer, no electronic primers. No recoilless rifles to be used, all combustion gasses must exit via the muzzle/ muzzle break/moderator. 4.5 Assistance from a spotter is permitted. 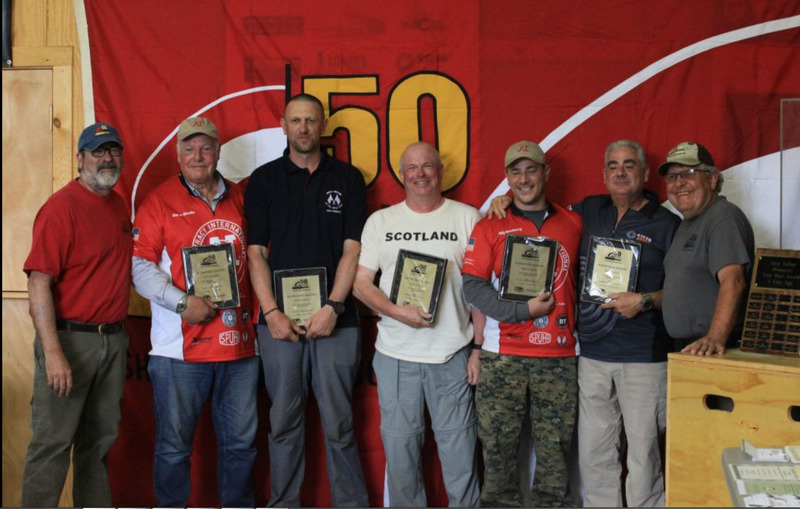 The following competition classes are those as defined by the FCSA (USA), however due to a smaller membership base, the FCSA (UK) has opted to hold all its competitions on a class 4 basis (hunter class, prone supported under 50lbs). Once sufficient numbers of potential competitors show interest in splitting into the separate classes as shown below, then the competition scoring system will be modified accordingly. Shall be restricted to a rifle that shoots a .50 cal. BMG cartridge and is capable of chambering an FCSA approved chamber gauge that has a maximum outside neck diameter of .554 inches. The rifle shall be restricted to a total overall weight of thirty two pounds and eight ounces (32 lbs 8.00 oz.). The maximum weight of the rifle will include any equipment attached to the rifle that would be used by the competitor during the shooting competition. The rifle stock shall be restricted to a maximum forend width of three and one half inches (3 and 1/2 in.) The forend of the rifle will be that portion of the rifle stock toward the muzzle of the rifle, in front of the forward most retaining screw that holds the rifle receiver into the rifle stock. Any rifle that shoots a bullet with a diameter of .510/.511 inches and has a maximum overall weight of fifty (50 lbs.) Pounds. The maximum weight of the rifle will include any equipment attached to the rifle that would be used by the competitor during the shooting competition. The winner of a heavy class fifty caliber shooting competition shall be determined by the competitor who has the smallest accumulated extreme spread (aggregate group) for all record groups fired during the heavy class relays, except in the case of a tie. Any barreled receiver that fires a bullet with a diameter of .510/.511 inches. The winner of an unlimited class fifty caliber shooting competition shall be determined by the competitor who has the smallest accumulated extreme spread (aggregate group) for all record groups fired during the unlimited class relays, except in the case of a tie. Competitors will shoot and compete from a prone shooting position with rifle equipped with bipods or supports as defined below. To shoot from the ground with the aid of an optional ground mat and/or blast sheet. The use of an earth-only trench for the bipod feet will be allowed. Anchoring of the rifle to the ground by any means is prohibited and the firearm must be free to be lifted straight up from the firing position. Bipods must be able to fold forward or backward. The bipod can only provide two points of contact to the ground and must be mounted to the rifle forward of the trigger guard. Tripods are forbidden. Rubber or non-metal feet are allowed. Spikes on the bottom of the bipod feet can be a maximum of 30mm long. Bipods that are of spike design must have a marking on each leg which is plainly visible 1.5 inches from the bottom of the leg's spike. The marking on the spike portion of the bipod is to ensure that the spike does not enter the ground to a depth exceeding 30mm. The 30mm is the depth limitation that a bipod can be driven into the ground during shooting. Rollers or track/rail devises are prohibited. A soft pliable bag may be used. Monopods are allowed. A monopod is any device attached to the rifle at any point to the rear of the trigger guard and used for the purpose of raising or lowering point of aim. The monopod must use a foot which conforms to the same dimensional requirement as a bipod foot but may not have a spike. The monopod must be attached to the rifle when determining overall weight of the rifle. Rifle in this competition may not exceed fifty pounds (50lbs) total weight in shooting readiness. Any [50BMG] cartridge using a .510 - .511 projectile. The winner shall be determined by the competitor who has the smallest accumulated extreme spread (aggregate group) for all record groups fired during the hunter class relays and recorded between July and June, except in the case of a tie. * Distance: 1000 yards | Total number of shots on target:10 | Smallest group of 4 to count (Nov 2006 rule change) | No sighters | Time limit 30 minutes per target. Acceptable projectiles are military ball, jacketed lead core, solid brass/bronze, copper driving banded turned steel or Tracer if range restrictions permit. The type of ammunition used in FCSA sanctioned matches is also governed by Section 1 UK Firearms licensing restriction. Unsafe surplus or reloaded ammunition shall be banned from any FCSA sanctioned shooting competition. It shall be the responsibility of the match director or his/her designated NRA qualified range conducting officer to make a determination regarding the suitability of surplus or improperly reloaded ammunition. Poor quality surplus or reloaded ammunition displaying characteristics such as corrosion, damaged brass, improperly seated primers or damaged projectiles will not be allowed to be used in an FCSA sanctioned shooting competition. The round of ammunition should be easily chambered and the bolt closed by hand. The use of a hammer to close the bolt is forbidden in FCSA (UK) competitions although a hammer may be used to open the bolt. A rifle rest is permitted to support the forend of the rifle. A rifle rest is also allowed to support the rear of the rifle. Rifle rests are restricted to the sand bag type made from soft pliable leather or a soft pliable material, filled only with sand. The rests cannot be attached to the rifle itself or connected to each other. Front and rear rests must be movable independent of each other. Neither rest is allowed to be attached to the shooting bench and the rifle must be able to be lifted vertically independent of the rest. Rifle rests shall not restrain the recoil of the rifle. Drag reducing tape may be applied to the surface of a rest. Bipods are acceptable in any class of FCSA sanctioned shooting competition. Only the NRA MR-1 600 yard target is approved for FCSA sanctioned 1000 yard shooting competitions. The mandatory use of one (1) specific target for use in sanctioned matches is to assure uniformity of information regarding group size and scoring records. Regional Matches may use other targets if the FCSA standard target is not available at the range where the FCSA sanctioned match is being held. If that occurs, all competitors must have the same target. It is recommended that wind flags be used at all FCSA sanctioned shooting competitions. The placement of wind flags on the firing range during a shooting competition will be at the discretion of the match director. This does not preclude competitors from using and placing their own wind flags/wind measuring devices on the range during a shooting competition. Are not allowed for class 1, 2 and 4.